Himansu Rai is credited with bringing technical sophistication to Indian Cinema. He was among the earliest Indian filmmakers to collaborate with European filmmakers and try to improve the quality of Indian filmmaking with the help of foreign technical know-how. Rai was born into a wealthy Bengali family which owned a private theatre. He took a Law degree from the University of Calcutta and studied with Tagore at Shantiniketan. He trained as a lawyer in London in the early 1920s and also began acting in plays there, amongst them Niranjan Pal’s The Goddess. 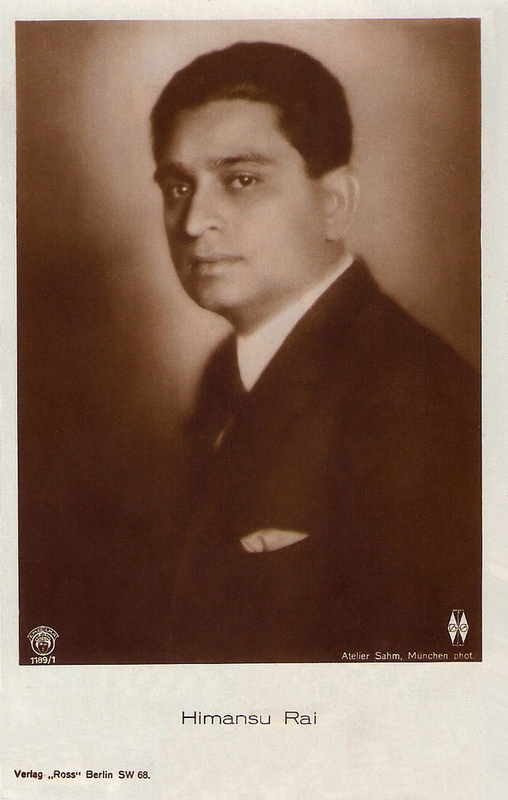 With Pal’s script, adapted from Edwin Arnold’s poem, The Light of Asia, and his persuasive powers, Rai went into partnership with the German producer Peter Ostermayer whose brother Franz Osten co-directed the film The Light of Asia (1925) with Rai and starring Rai himself as Gautam Buddha. The film, co-produced by the Great Eastern Film Corporation in Delhi, was hyped as the ‘first specifically Indian Film’ by Osten and was fairly successful in Central Europe. Rai then collaborated with Germany’s famous studio UFA and made Shiraz (1928) and A Throw of Dice (1929) there. The films were known for presenting ‘Indian exotica’ to the West. In London meanwhile, Rai had met Devika Rani who had designed the sets for The Light of Asia and who continued to work with him. The two got married and in 1933, Rai joined forces with IBP of England and wholly produced Karma/Nagan Ki Ragni, a bilingual in English and Hindi. The film starring Devika Rani was a critical success but failed to score at the box office. The Nazi seizure of power in Germany caused Rai to abandon more International co-productions and concentrate on the domestic film market in India. Late in 1933, Rai and Devika Rani came to India bringing with them the as yet unseen Hindi version of Karma. The film premiered in Bombay in early 1934 and was highly acclaimed. That year Bombay Talkies Ltd. was formed and a studio built. Under the painstaking supervision of Himansu Rai, it purchased the most modern equipment from Germany. Franz Osten, director and a handful of technicians came down from England and Germany. By 1935, a stream of Hindi productions began to emerge from Bombay Talkies Ltd. Some of the important films under Rai’s supervision at the studio include Jeevan Naiya (1936), Achhut Kannya (1936), Savitri (1937), Izzat (1937), Nirmala (1938) and Durga (1939). Devika Rani played a key role in these films and was the leading star of the Studio till Leela Chitnis took over from 1939. It was said that top actors on occasion even helped to clean floors! Bombay Talkies maintained a school for children of staff members, which also became a school for child actors. It also had its own physician who also supervised the sanitary practices of the canteen. Bombay Talkies settled down to a schedule of about three films a year. Their films were of a high technical standard and had a glossy look to them reminiscent of the films of MGM with Devika Rani being lit up in a manner not unlike Greta Garbo. The films were largely good-looking entertainers with the occasional social issue thrown in and treated in a highly sugar-coated manner to make it easier to digest by its audiences. The outbreak of World War II meant that the German technicians and director Franz Osten were interned by the British, thus crippling the studio. Overwork and mental strain took its toll on Rai who suffered a nervous breakdown. He never recovered and died on 16th May, 1940. After Rai’s death, Devika Rani took over the reins of Bombay Talkies. But by 1945, she too left following tussles with other studio executives. Though Bombay Talkies came out with successful films like Ziddi (1948) and Mahal (1949), its days were numbered. Badbaan (1954), a last ditch effort made for the workers of Bombay Talkies proved unsuccessful and the studio ceased production.